A Princess Line Dress for Genesis 3 Female for use in Daz Studio 4.8. Cute dresses - many thanks! Cool! Can't wait to try this little number. Wish I was rich to pay you for this. Thank you so much for sharing your creation. I have question what if is used this on my game ? is it also redistribute? Thank you for your beautiful dress! Thank you for the lovely dress and textures! Thank you for your generosity, Wendy. Many of my characters would be house-bound, but for your creativity. Lovely and decent - thank you very much! Very nice looking dress,thank you for your kindness. Lovely dress. Thank you so much! Many Thanks for all of your amazing contributions. Wendy, love all the wonderful textures and the Princess Line Dress is so perfect for everything! Thank You! Thank you for sharing so generously! Oh MY is this a pretty dress.... Nice and simple... THANK YOU! Wow! Super Kawaii. Thank you very much! 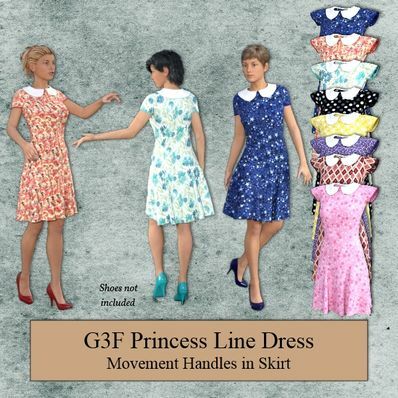 Many thanks Wendy for these very pretty additions to your line of clothing for G3Fs. Thanks for your generosity of sharing your unique style of creativity with us.